Battling with Quicken, nightmare spreadsheets that require hours of work to maintain – I’ve been there. Before Mint money management was pretty bleak. What is Mint and how does Mint work? Mint is what we consider to be the most powerful tool available to automate your money – not to mention, it’s free. We created Mastering Mint to explain how we automate our money. In addition to getting the most out of Mint money management tools, we discuss the best practices for managing your money so you can start making some real progress, today. Convinced? Jump straight to the book. When I found Mint in 2007 it revolutionized the way I viewed my money, but using it was just the first step. Mint easily stole hours of my life when I wasn’t using it correctly. 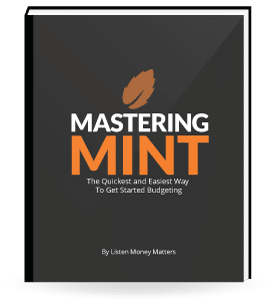 For me, the next step was to learn how to make the most out of Mint money tools so I could stop wasting my time and start managing my money effectively. What we’ve done is outline exactly how to automate your money management so you spend the least amount of time possible doing it. Our framework provides actionable steps so you can take control. Not everything in Mint is straight forward, especially managing your transactions. We show you how to automate the worst of it. Also learn about the best practices so you can set your account up with minimal effort. Take the guesswork out of budgeting. Follow our core guidelines and find out when your spending is out of control. We also discuss how to create goals you can actually achieve and how to know when you’ll reach them. Overcharges, double charges, fraudulent charges, it’s all part of life. It doesn’t mean you have to fear them or worry they are slipping by unnoticed. We teach you how to quickly find the bad transactions through email alerts and what we call, The Weekly Practice. It’s one thing to know the dollar value of your investments and it’s another to understand how well they’re doing. We show you the graphs that matter and how to tell if you’re doing better or worse than the average investor. You know you need to save, but to what end? It’s time you learned the surprisingly easy math behind early retirement. We show you how obtainable retirement is and how far away you really are. Everything you need to manage your money.